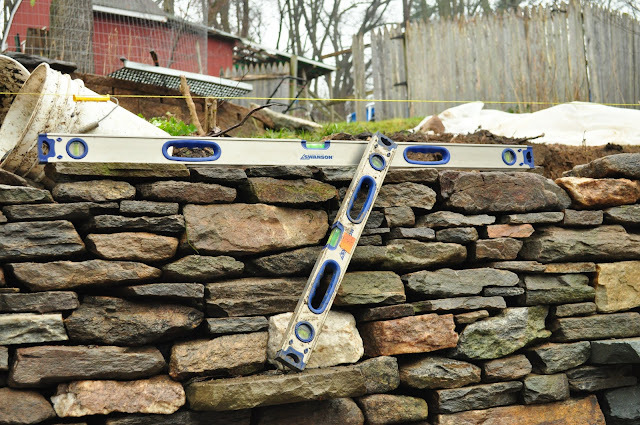 When I'm building stone walls I find myself using a 2 ft and my 4 ft levels a good bit to check my work. (In that order) The time had come to replace my first levels the Stanley Fat Max. The Stanley Fat Max levels had lost color in the sight glass due to years of UV light. I spent a evening running from one box store Home Depot to another Lowes. I looked at every level on the wall. I liked the idea of a Made in the USA as such products like the Johnson Levels. But the wood level with the curved bubbles does nothing for my building in stone. Almost every level I looked at had a blind spot on the bubble or only offered a week view. Like the Stanley. Seen below. How can you see that. It worked for years because I didn't know any better. I also had such problems with water getting inside during a rain storm making it a nightmare to see anything. I fixed that by pulling the plastics apart and sealing them with a silicon. Sorry not going back now- good back up as it sits in my trailer collecting dust. Might make for a good back scratcher. Now take a look at the 4 ft- not to bad well protected from any kind of impacts. But so old school. After spotting the Swanson Levels. I was hooked. What was really nice was how the spirit bubble was encased in a clear plastic - helping to magnify the bubble. The site of the bubble can be seen from several clear angles. With out a piece of metal or some other form of material blocking the view. The Swanson bubble is easy to read in low light due to the high contrast yellow spirits. The bubble was much larger then most, of the choices I had to choose from. As seen comparing my old 4ft Stanley FatMax on left to the new Swanson 2ft IBX level. BIG Difference. Stanley might want to change the name to Skinny Hidden. Nothing Fat about this level! Except it does work just like any level would with accuracy and I will say, light weight, longevity with a quality build. The Swanson was the only one I spotted that day with multiple bubble markings. 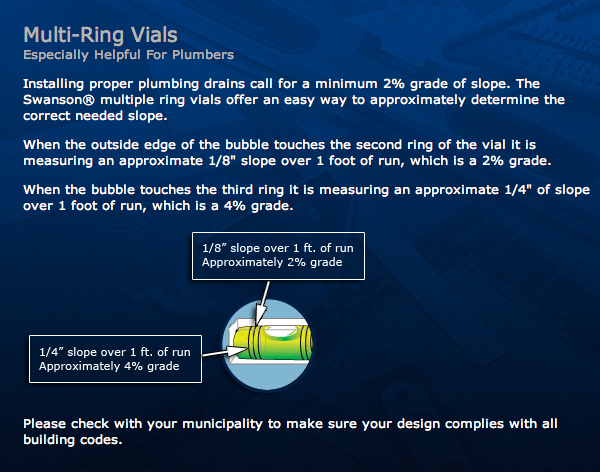 The Multi-Ring Vials helps with grade run as seen from the screenshot include below from Swanson's website. Screenshot direct from captured from Swanson's website to visit this page Click Multi-Ring Vials. What I like about the multi rings are if for some chance I'm doing a walk or a patio-as most call it flat work when laying natural stone. 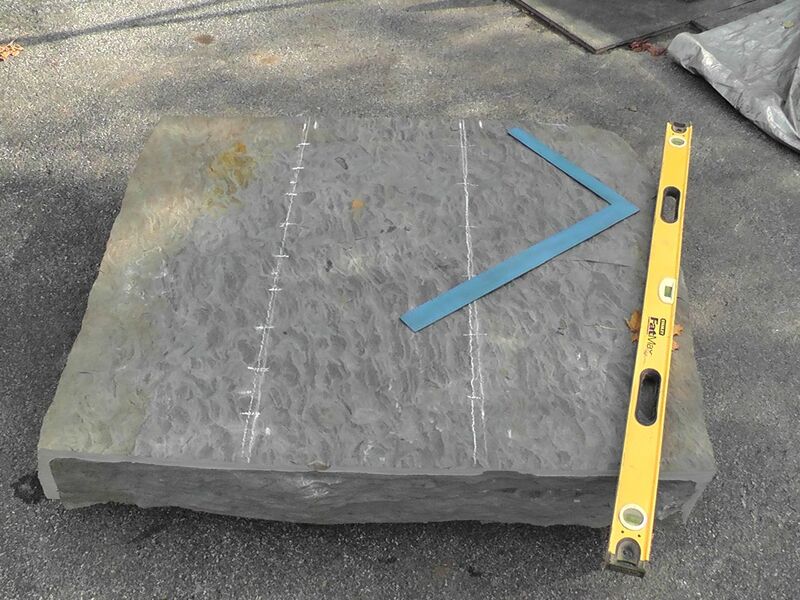 You should always have a 1.5% ( .1875 x ft =) to 2% (.25 x ft =) Grade to help water run off. This level could come in handy for such a situation if needed. I just like the accuracy of seeing how well my brain is working when placing stones on one another. No one needs a level if they have a Brain. We all have natural instincts we just sometimes forget and let tools make us lazy and dumb. Heck I remember the days before cell phones. I could remember just about every one of my friends phone numbers. Now I couldn't even tell you my own Google Voice number. How bad is that. Why do they call them Smart Phones? How quick we forget to use what we have been given. Just don't fly south every winter and you'll do ok.
A level will help you as you train your brain to trust what you are building. I love my levels they are doing a great job. 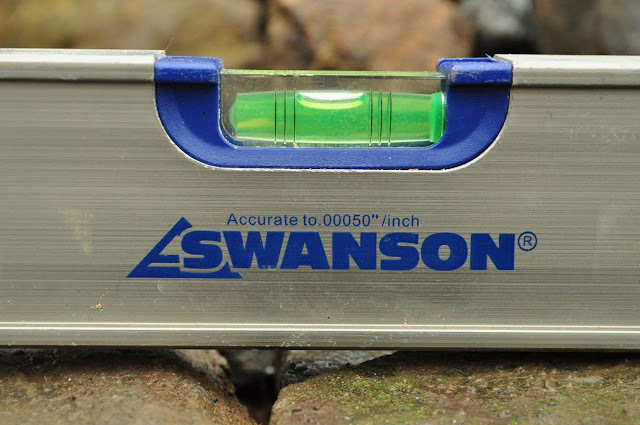 Thank you Swanson what's next after the the Lighted Box Beam? This might be great for my buddy Dale who loves to wall in the dark. Or just those short winter days. What's your level of choice?